We are accepting applications for the "Electronic Music production course" starting on 31st July 2019 at B-11,IMM .Building, Qutab institutional area new delhi-110016. 1. No of seats: We have 12 seats to be filled on interview basis for Indian students. 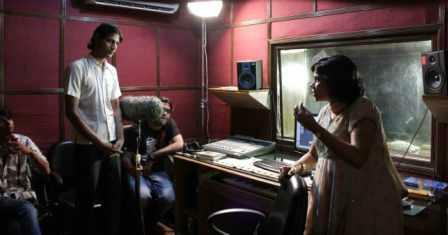 15 May-for Sound Recording & Audio Engineering Course & Film /Video Editing Course. 6. Hostel facilities: We don’t have a hostel, but we help u to find economical accommodation near the institute. Generally room cost between Rs. 4000-4500/- per month which on sharing basis will cost around Rs. 2,000/- 2500 per month. There is food joint near CRAFT where most of the students have their lunch and dinner. 7. Class timing: “LEARN BY DOING“is the main philosophy of the Center. Classes take place 5-days in a week. Screening of movies- 8:00 a.m. to 10:00 a.m. and classes are from 10:30 a.m.-1:00 p.m. with 30 minutes tea break. 9. Course Duration: Electronic Music Producer is part of "Sound Recording and Audio Engineering" as specialization in the 2nd Semester . 10. CRAFT’s Legal Status and Its Affiliation: CRAFT is registered as a non-profit making public charitable trust with sub-Registrar in Delhi Govt. and offer autonomous Diploma courses. CRAFT was established on 6th March 2006 and it is our 11th year of operation. Nor do the AICTE give any accreditation for any such specialized media courses. In fact, AICTE does not even understand the media courses and hence no P.G college/institute offer the degree program. All private/nongovernment institutions (like CRAFT) offer one-year diploma programs. If you honestly ask, in the media industry nobody is concerned about your degree/ diploma/certificate. What they are looking at is your capability as event management/ director/cinematographer/ editor, your overall smart personality, good communication skills and understanding of your profession you have chosen. 12. Bank Loan Provision: We do not have any tie-up with any bank but if you can get the loan, we can issue any letter required from our end. 13. Management quota seats:-There are 4- management quota seats available in each course in which one can seek direct admission without an interview. One has to pay additional Rs 20,000/-(rupees twenty thousand for blocking the seat) besides regular fee. Overview: What Exactly is the Electronic Music Production Course. The Electronic Music Production course at CRAFT FILM SCHOOL is a rounded music course which covers many aspects of modern music production. Various stages in production such as composition, styles, song-forms, instrumentation are covered. Technical aspects such as voice and instrument recording, audio and midi editing on a digital audio workstation and a look into mixing using onboard plug-ins. Students will have access to professional DAW session files of leading music producers and will be guided as to how these were created and why they work. To top it off, students will also be receiving over 8 GB of royalty-free samples and loops that they can use in their own compositions. With this course, we aim to provide one of the best electronic music production courses in Delhi and possibly India! Welcome to the school of Electronic Music Production. Creative Sampling: How to Make Audio Loops sound Interesting! PLACEMENT support: We believe in rigorous and meticulous training that would instill confidence among the students so that finding a suitable placement in the industry will not be a major issue for any graduate of our institute. However, our responsibility doesn't finish after giving them the best possible training. It is equally important for us that our students should find best positions as per their aptitude. First category of students we support them in two ways A) Incoming inquiry mails forwarding: We receive e-mails from companies which are looking for fresh Graduates. Such job posting is displayed on the college website and will also be forwarded to the facebook group of the current batch. From Jan 2010 batch it is mandatory to all the students of various courses to join the facebook group. B) Outgoing placement activity: an updated list of various relevant media companies’ concerned HR is prepared. On weekly basis, pdf file of the placement brochure is e-mailed. Besides the above, placement officer also keep a track of various openings about jobs providing sites and another job forum on the net. He posts such vacancies in yahoo group. Our ex-students who are well placed in the industry are explored to have networking for current students. Students of category , who are looking forward to work with individual feature film director /cinematographer /editor /Sound Records as an assistant on feature film projects and later to start independently. For such students, Personal efforts are made by the teaching faculty /guest faculty to connect our current passing out students to seek an easy appointment in Bombay and other regional film industry in Calcutta/madras/Hyderabad. We completely understand that once any student who is new to the media industry needs support in terms of contacts to start their career as an internship which leads to the recruitment. Students are provided networking opportunity with various guest faculty workshops or visit to international film festivals in Delhi /Goa .Through our placement cell, we will be making all possible efforts to find suitable positions for them. We are committed to build a fraternity in the media industry.